Basketball has never been my gig. I haven’t actually played it so I only have a rudimentary understanding of rules and strategy, but it’s action packed enough that I can get on board as a spectator. Which is a good thing, because both T-man and Bear have played it for the last few years. So far they’ve mostly dabbled, playing in what I can only describe as a “feel good, let’s build our skills together” sort of league. 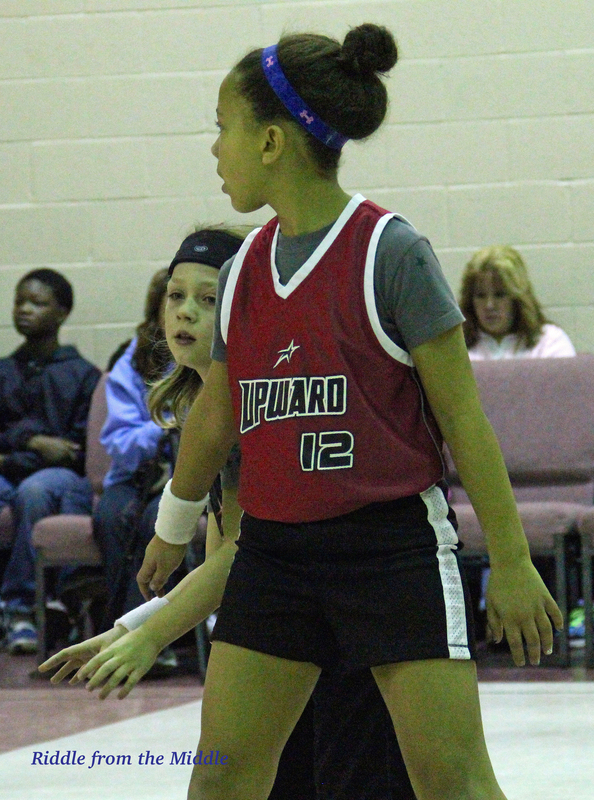 Last winter I tried to get them to sign up for a more challenging organization – not because I think they’ll be going pro, but because it seemed like they’d outgrown what their program offered them. They didn’t take me up on the offer. And while they both had a lot of fun playing, by the end of the season T-man and Bear agreed: they wanted to find another league. That had been our basketball experience to date, which is why I was so pleased last spring when T-man spotted a flyer that stopped him in his tracks. 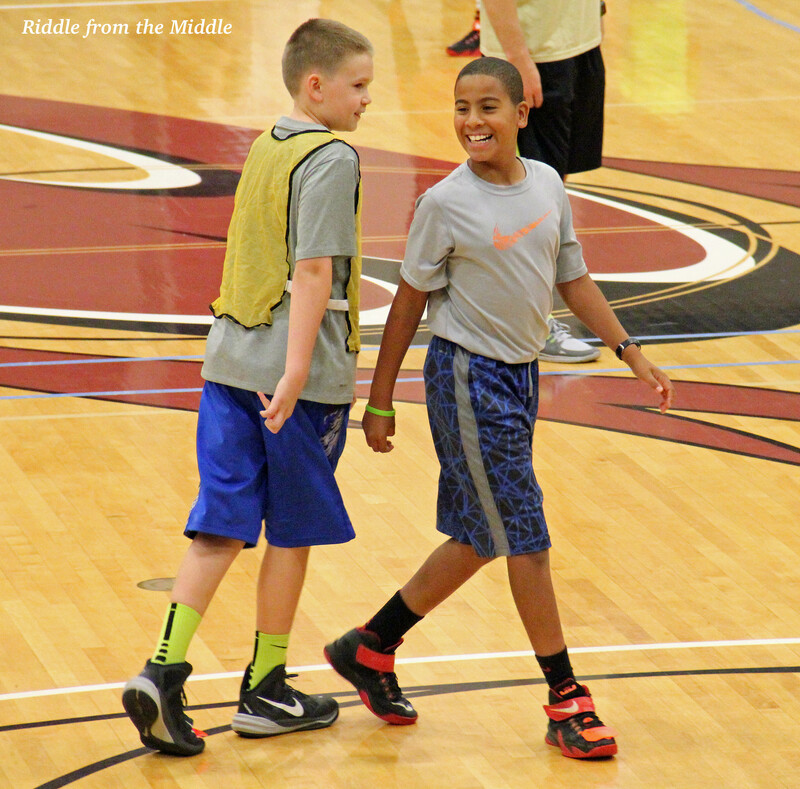 It was for a boys’ basketball camp being held at a local university, and his eyes lit up as he turned to plead his case. Could he please, please, please, please go?! Meanwhile BrightSide and I were thinking Good Lord, yes, and thank you for showing spirited interest in something other than a) skateboarding or b) your iPod. I went home and contacted the camp that same afternoon. It actually looked like a fabulous opportunity. 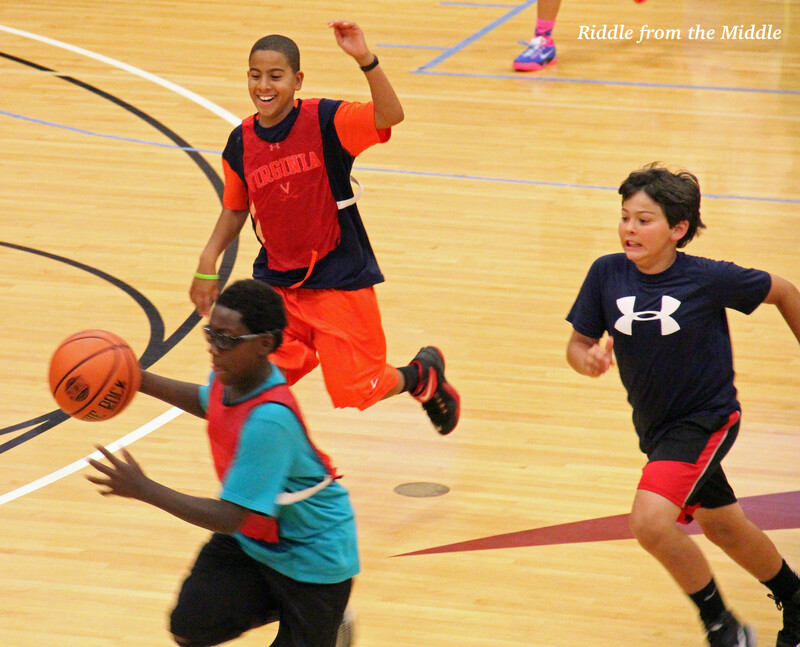 The men’s head basketball coach at Elon University was running a week-long camp for boys ages 7-17, and it featured days packed with skills stations, contests, and basketball games. 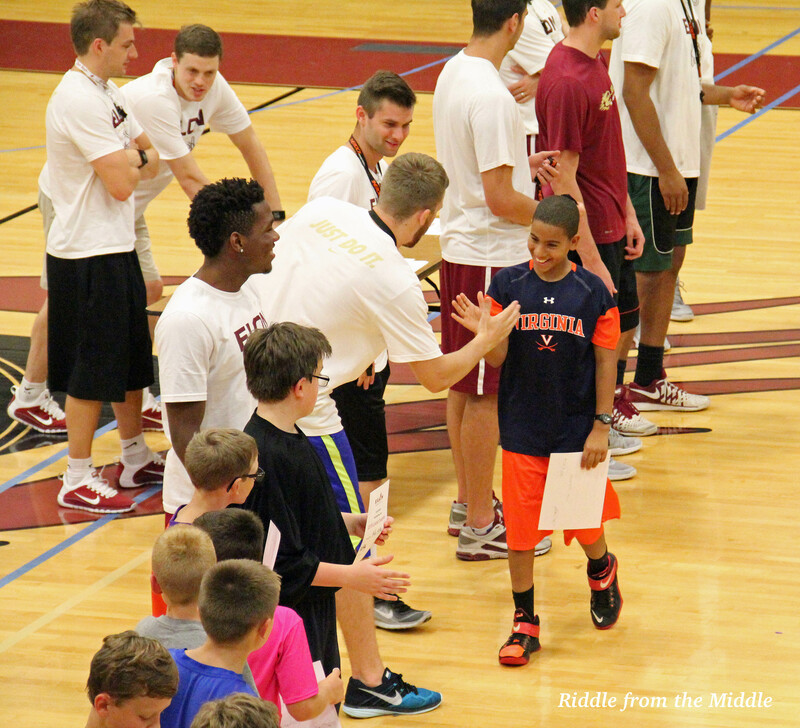 Even better, the boys were divided into teams that were coached by Elon players. And if you don’t think it’s life changing to have a gigantic college basketball player spend the week teaching you skills, strategies, and tips about life (i.e. 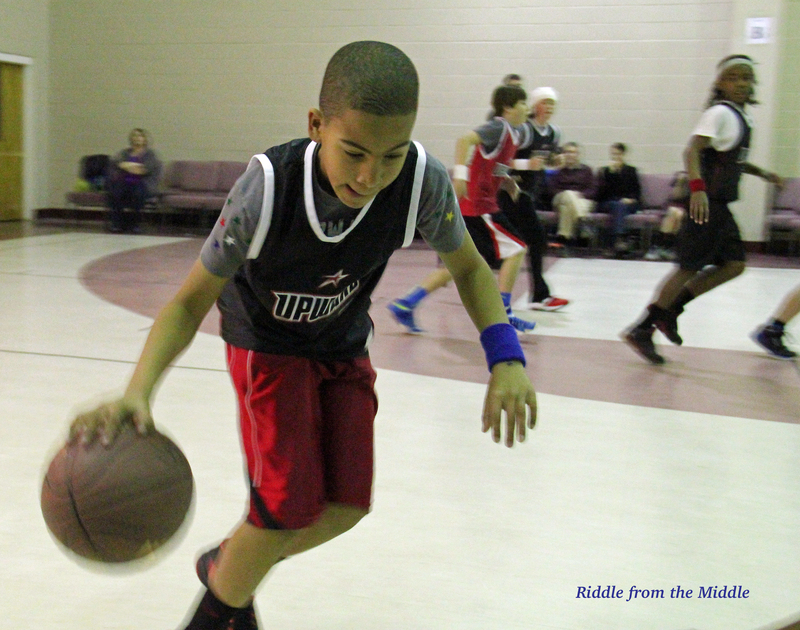 what it takes to play for your school)…well, then you’ve never seen a 9-year-old boy in a camp like this. T-man’s team with their coach. T-man probably learned more in that one week than he had his entire last basketball season. 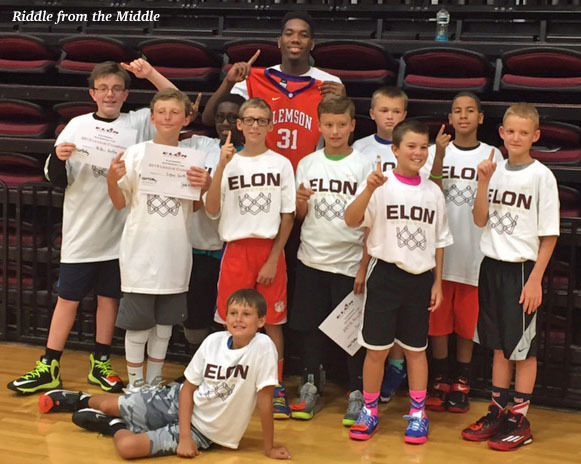 This leap forward was due to a lot of different factors: the enthusiasm he had for the camp; feeling personally driven to learn; getting one-on-one instruction from incredibly talented athletes; and the experience of being in Elon’s Alumni Gym, surrounded by a hundred boys/guys/men, all pumped about the sport. We’d walk into that gym in the morning, music cranked to a deafening level for warm-ups, boys everywhere dribbling and shooting and practicing their moves. The kids would come half an hour early just to have that extra time with each other to jam out while they practiced. There was energy…excitement…joy in the game itself that was electric in the air. And T-man loved every minute of it. There’s no doubt that T-man worked hard that week. He was exhausted at the end of every single day, but it was the fatigue of someone who’d spent all day doing something he loved. And the very first thing he asked at the end of camp? If he’d be able to go again next summer. Hoops and heroes. 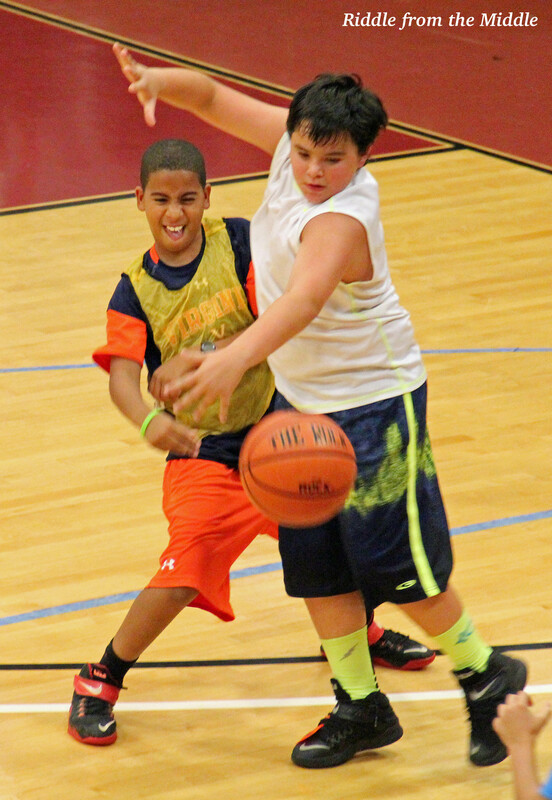 There’s no other way to describe T-man’s basketball camp experience. It really was incredible. I loved the coach’s approach — we were in the gym for some of his “team talks” and he really approached it as teaching not just the skills but teamwork and personal responsibility, too. I highly recommend for anyone in my area!! What a wonderful program! I’m so happy T-Man was able to participate.